Thank you to Pinellas County Schools for providing this platform to share the FDLRS Gulfcoast story. The Florida Diagnostic & Learning Resources System is a discretionary project of the Florida Department of Education that provides diagnostic, instructional, and technology support services to district exceptional education programs and families of students with disabilities. FDLRS Gulfcoast is one of nineteen service centers statewide, with direct service provided to Pinellas, Pasco, and Hernando Counties. Child Find (Early childhood screening and planning) - Provides assistance in the location, identification and initiation of appropriate education or other needed services to all children with disabilities, birth through 21 years of age, who are not enrolled in public school. Primary emphasis is on children 3 through 5 years of age. Parent Services - (Partnerships between families, schools, and communities) - Assists families that have children with disabilities to develop effective partnerships with their home school district, fostering an environment of shared responsibility for improving the education of all children and youth. Human Resource Development (HRD) - (Professional learning and support for educational providers) -Identifies and helps meet individual personnel development needs within the service region through information about training, resources, and promising practices that respond to personnel development needs. Additionally, HRD provides training opportunities designed to meet the specific needs of individual school districts within the service region to support the attainment of state and school district goals, and assists in the development and delivery of educational services to support the initiatives of the Florida Department of Education's Bureau of Instructional Support and Community Services. Technology - (Assistive, communication technology, and instructional support) - Provides assistance and support in the appropriate use of assistive, instruction and communications technologies for professional staff and families, as well as children and youth who are exceptional and/or have special or unique needs, to support student achievement and promote academic success. The Production Lab is now the center of a classroom learning environment for Extended Transition students. 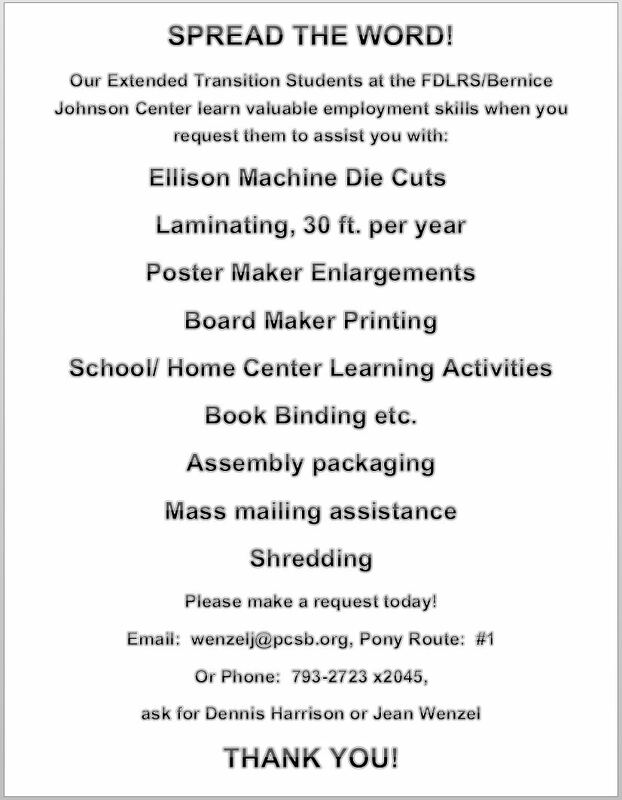 Please consider retaining the services of the students in the ET class for production of items to enhance your lessons, create visual aids, and support student learning. Contact Ted Machler for more information or to submit a request for service. to learn more about the ET Classroom services. The Florida Diagnostic and Learning Resources System FDLRS is funded by the Florida Department of Education, Division of Public Schools, Bureau of Exceptional Education and Student Services, through federal assistance under the Individuals with Disabilities Education Act (IDEA), Part; IDEA Part B, Preschool; and State General Revenue funds.